Importance. -- Carpenterworms are serious borers throughout the United States. Wormholes cause degrade estimated at 15 percent of the value of rough sawn lumber and unsightly scars on ornamental trees. Identifying the Insect (figure 19a). 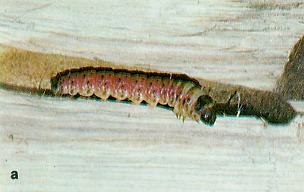 -- Newly hatched larvae are .25 inch (6 mm) long and reddish pink. Larvae gradually become greenish white and are 2 to 3 inches (50 to 75 mm) long at maturity. Brown pupal skins protruding from entrance holes are common in early summer. 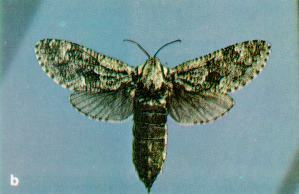 Adults are grayish, stout-bodied moths; the hindwing in the male has an orange spot (figure 19b). Identifying the Injury (figure 19c). -- Earliest signs of attack are sap spots on the trunk. Later, frass (wood chips and pellets) is ejected from entrance holes. Burrows 2 inches (50mm) in diameter under the bark, and galleries .5 inch (12 mm) in diameter and 5 to 8 inches (12 to 22 cm) long in the wood are typical. Galleries are open or only loosely plugged with frass. Holes in lumber are dark stained. Biology. -- Adult moths appear in April to June and deposit 400 to 800 eggs in bark crevices. 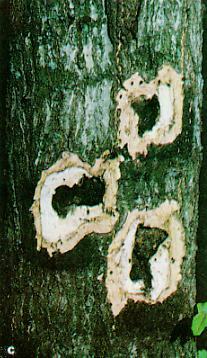 Eggs hatch in 10 to 12 days and young larvae tunnel into the bark and wood. Pupation occurs within the gallery during spring and lasts 3 weeks. A life cycle requires 1 to 2 years in the South, and 2 to 4 years in the North. Control. -- Maintain high tree vigor. Remove brood trees. Prevent bark injuries. Natural enemies help. Control with trunk spray or gallery fumigation. Figure 19. -- (a) Carpenterworm larva in gallery; (b) carpenterworm female moth; (c) tree trunk with carpenterworm attacks.